When it comes to seamless integration into your work environment and helping you get important tasks done faster, there’s no smarter option than the affordable, reliable and supremely business-ready VersaLink B7025/B7030/B7035 Multifunction Printer – featuring Xerox ConnectKey Technology. With an entirely re-engineered paper path an new LED print head technology, day-in, day-out reliability reaches a new impressive level of excellence. With the VersaLink B7000 Series Multifunction Printer’s oversize, customisable 7-inch colour touchscreen, you can tap, swipe and pinch your way through tasks and functions with mobile-like ease. 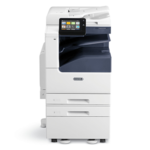 Preloaded Xerox ConnectKey Apps help optimise office efficiency, and on-screen access to the extensive Xerox App Gallery provides expanded functionality – like the Xerox Easy Translator Service app, which quickly translates scanned documents into numerous languages. With 3 devices in the range – B7025 / B7030 / B7035 – speeds range from 25ppm to 35ppm.